I’ve written extensively about my struggles with dry skin and the Austin summer heat makes me feel like a dry sponge. Yeah, it sounds and feel gross! I’ve found lots of great moisturizes over the years that work for me but Curél Hydra Therapy Wet Skin Moisturizer is in a whole new league for dry skin goodness. Why? Well, as a mom to two young girls, I don’t have a lot of time to get ready – almost ever – and with Hydra Therapy, I can apply immediately after a shower and even towel dry off. No fuss, no waiting, and it works! See the future of moisturization with Curél Hydra Therapy Wet Skin Moisturizer as it will end your dry skin for good as it contains two soothing and restorative ingredients — allantoin and panthenol — to ease dry, itchy and uncomfortable skin. 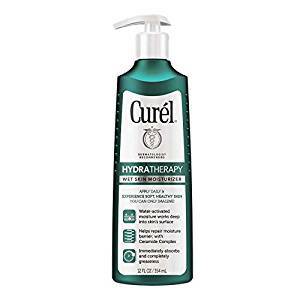 Curel Hydra Therapy Wet Skin Moisturizer is activated by water on freshly-showered skin and penetrates deeply into the surface to heal dryness, for soft skin you can only imagine. After showering, your pores are open, providing an easy pathway for moisture to absorb into just-showered skin. Curél® HYDRA THERAPY WET SKIN MOISTURIZER, with Advanced Ceramide Complex, penetrates deeply into the skin’s surface bringing moisture to the source of dryness. It absorbs immediately and with continued use will end your dry skin! Ceramides, naturally present in healthy skin, are vital building blocks to maintaining skin’s moisture barrier. When ceramides are lost, skin becomes dry and damaged. Curél® HYDRA THERAPY WET SKIN MOISTURIZER, with Advanced Ceramide Complex, penetrates to the source of dryness, helping to replenish skin’s ceramide levels and repair the moisture barrier.